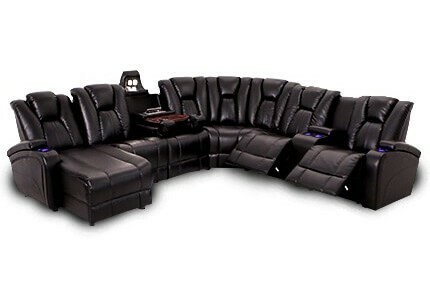 When setting up your ultimate home theater, you have to decide on a focal point - the TV/screen, the decor, or the seats? What’s it going to be? Of course in our minds, it’s all about the seats - after all, that’s where you’ll be planted for the next two hours as you catch up on the latest Marvel movie release! There are so many factors to consider, from the size to the style and ultimately the cost, that the idea of searching through the infinite possibilities is just overwhelming! Where do you even begin?! Don’t worry, readers, we are here to break down the search and decision process so your time is saved, and your mind is put at ease. First things first, you have to measure your home theater for dimensions. There’s nothing worse than choosing the seat of your dreams, only to get it home and realize that it is too big or small for the room! What you’ll need to do is calculate the dimensions of your room, and what size of seat will best fit within those walls. You’ll want to make sure that there will be enough room around the theater seats for you and your guests to walk around comfortably, and that you place the seats in the perfect position to receive the best image from the television and perfect sound quality. It’s like they say, just like with real estate, it’s about location, location, location. So, make sure that your home theater and seats are in the perfect location! The next step: Deciding how many you want and can accommodate in your space. 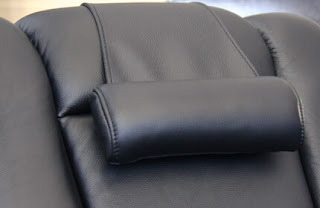 It may seem like a small detail, but it helps determine the size and style of the seats, and how many you’ll need. If you’re the type of person who likes to reserve your home theater to close friends and family, then don’t spend money on a large quantity of seats and just keep it simple. Go small and keep your theater nice and cozy for the entire party. Maybe try out cuddle seats for a totally different viewing experience! If you love to invite large groups of people over to your home and want a theater that can contain all their energy, then you’ll want to invest in the larger seats. Bring the entire gang together with Seatcraft sectionals or a few rows of your favorite Seatcraft chairs! Ready to discover your inner designer? Seatcraft makes it easy to select your chairs and then custom design to fit your taste and budget! 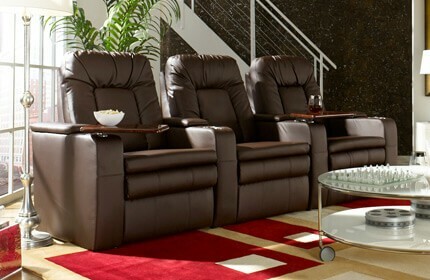 Choose from a wide variety of colors, finishes, leather, and upholstery! If your guests are the type to spill snacks and make a mess, try looking into vinyl and leather! They are more durable than fabric and are stain resistant! If you want a softer feel and the extra touch of comfort, fabric covered chairs will be the way to go. Now, it is time to decide which extra amenities you want to be added onto your seats. Why limit yourself to a standard chair when you can take your seats to the next level of comfort and design? There are many extras to choose from - like storage areas, cupholders, neck pillows, USB charging stations, and even refreshment consoles! The chair of your choice can also be altered to include lights inside the cup holders and underneath the seats, the option to recline, and can even include a separate ottoman or foot stool. Don’t be afraid to splurge a little on extra convenience and comfort! In the end, for many, it’s all about budget. Figure out priorities and go from there. Building a beautiful home theater room doesn’t happen overnight. There’s a lot of planning, installation, and design involved. 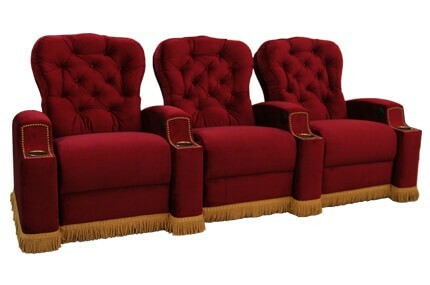 4Seating.com and Seatcraft have created a great relationship where comfort and affordability meet to build lasting and loyal relationships with our customers. Design the seats for your home theater while saving a little mula along the way. Quality and dependability are what we’re built on!